This morning was nice and cool and the perfect morning for making jam without heating the house up terribly. I used my new food mill on the apricots and the blackberries, but the blueberries just went into the blender. The results of my 3 hours of labor. 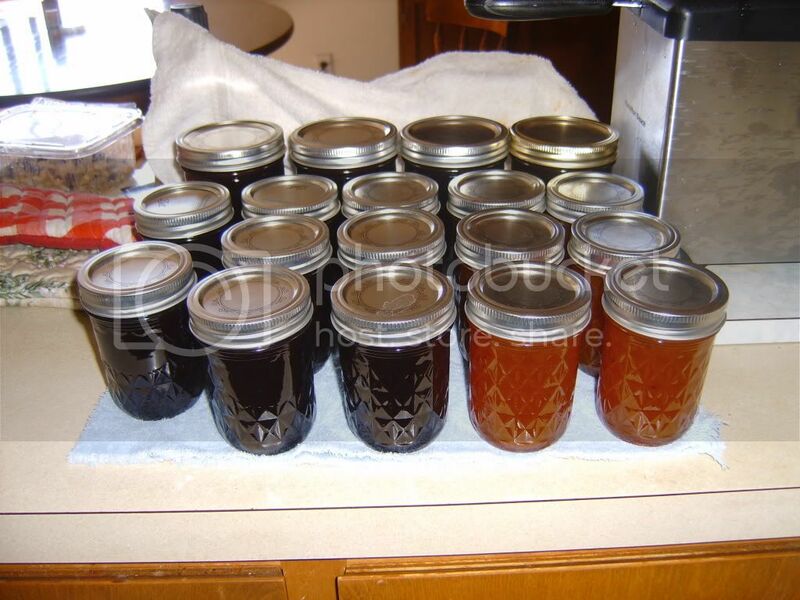 I ended up with six half pints of apricot jam, a value of $48 (organic jam has gone up, I priced it last week), minus the cost of sugar and apricots, so a net value of $40. I did 4 pints of blackberry jam for a value of $56. The blackberries were free, so the cost of the sugar was $2. So a net value of $54. Last I did 8 half pints of blueberry jelly. Again the berries were free from the yard so it was the cost of the sugar, $2. So $64 minus $2, a net value of $62. Altogether I spent $12 on ingredients and profited $158 by putting up this jam and jelly today. 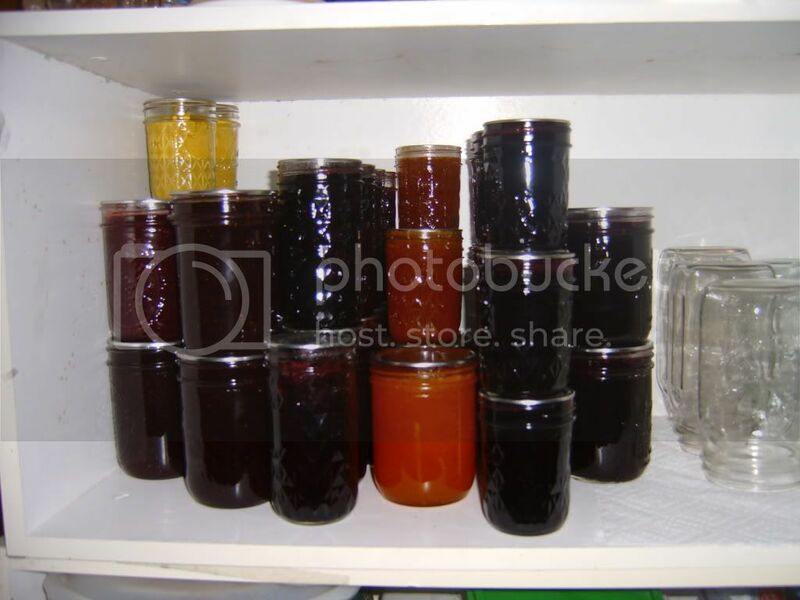 I will likely do at least one more batch of blackberry jam, one more batch of raspberry jam, and one more batch of blueberry jelly this summer and any other berries will be frozen. I think I'll have enough jam for the year. I may actually already have enough jam for the year, but some will be gifts. And another look at my expanded stash. We have used up one jar of strawberry and are in the process of eating a second and also on the first jar of apricot jam, but there are two more rows added as well. I can't wait until I can fill a shelf full of tomato products. Another month and a half for that. How beautiful! You should be very proud of yourself! Yummers! You are doing the stockpiling old school style. And if you have friends that grow and preserve other things (and you are confident in their abilities and ingredients): barter time. Your jams, etc. look so good! Nice Job! Those will taste so good come winter!! Wow, i wish i had some of those! good for you!